The 17-year-old South Shields rider took the final podium spot after a hard fight during Saturday’s sprint race at the Norfolk track. After making changes with the suspension on his MJJ Motorsport/Alpha Paints Ltd Kawasaki ZX6R, Corner was looking forward to hitting the fast and flowing circuit. He instantly gelled with the track and his new suspension felt right. After a hot and sunny Friday, it had clouded over but earlier spots of rain had been and gone by the time the pack headed out to qualify at lunchtime on Saturday. Corner put in a number of good laps to qualify third in Evo and 18th overall. Getting one of his best starts to date, he charged up the inside to make up three places. At the end of the opening lap he was second Evo bike. He was passed on the fourth lap and despite his best efforts he was unable to see off a charging machine behind, which passed him a few laps later and knocked him to fourth in Evo and 16th overall. But the teen wasn’t finished, and he could smell the silverware. “I was running down in fourth at that point and I just thought to myself ‘no, I’m not taking this, I want that podium back and I’m going to go and get it’. And that’s what I did,” he said. 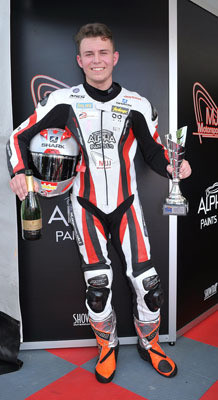 With three laps to run he made the move back up into third and held it to the chequered flag, recording his first podium of the season and the second since moving up to the high profile championship last year. “I really enjoyed that race but I had to really work for that third place,” he said. “I got a really good start, I was charging up the inside and I remember thinking ‘I hope this is going to work out when we all bunch into the first corner’ but luckily it was fine. “When I got passed and knocked down to third I was half expecting it, but I wasn’t happy when I went back to fourth. I made a bit of a push because the bike felt really good and I managed to get the spot back. 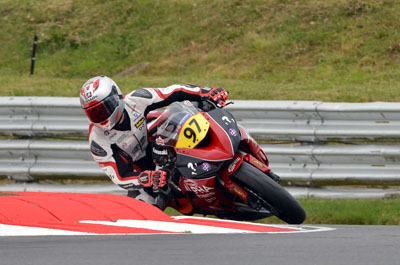 Corner’s second race on Sunday didn’t end so well, as he was forced to retire on the opening lap with gearbox problems. The bike is now being worked on ahead of the next round at Knockhill.